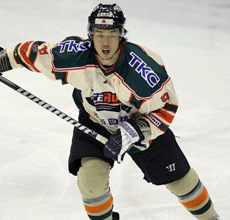 The Tohoku Freeblades have announced the retirement of defenseman Yamada Yuya. Yamada spent nine seasons in the Asia League (2007-2016 with four different teams. He started with Seibu Prince Rabbits in 2007-08 where he played for two seasons and reached the finals in 08-09 before going over to Korea and playing for High1. His career year came with High1 in 09-10 when he scored 12 goals and added 15 assists. His 12 goals lead all league defenseman. After two seasons in Korea, Yamada packed up for Japan to don the orange and black of the Nikko Icebucks for three seasons. In his first year the Icebucks went to their first and only Asia League finals losing 3 games to 1 to Oji. Not a man to stay in one pace for long, he moved up the highway to join the Tohoku Freeblades and won the Asia League championship in 2014-15. Yuya Yamada played 330 games and recorded 124 points good for 14th among defensemen.